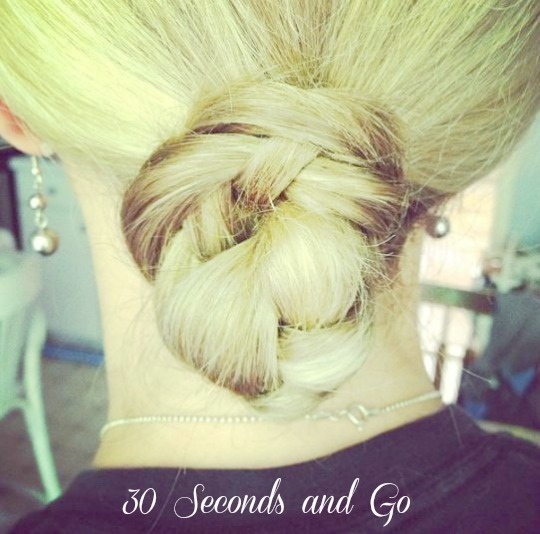 Last week, I posted on Facebook and Instagram this super quick 30 second braided “bun” that I literally created while I was sitting at the computer reading, and you all wanted to know how to do it. I almost feel silly for telling you because it’s just so easy. I’ve shared before that I continually get in the pony tail rut. It keeps creeping up on me and maybe I’m too sticky, from our A/C being out, or feeling too old to even care in the summer about my hair, but my newly turned ten year old daughter sure does. So, for her sake, I’m trying…again. Remember my 30 Days, 30 ways series? I need to kick that back into gear. Since I already had my hair in a low pony tail, all I did was do a traditional three stand braid, and then wrapped it around the pony tail holder. Yes, I told you it was easy. I didn’t even put a pony tail holder at the bottom because once I wound it around, my hair is thin enough that I just used bobby pins to secure the ends and sides. If you have thicker hair, use a clear, small elastic holder at the end. 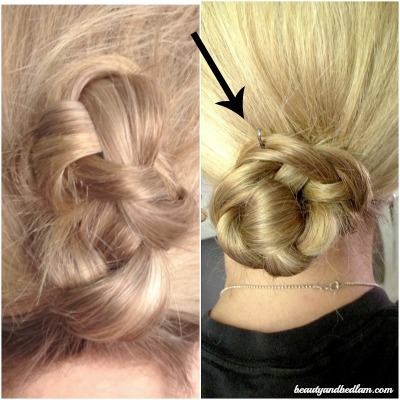 You can determine the look of the braided bun by how tightly you braid it, wind it and pin it. The braid on the left, I pinned it so that the braid lay more vertically, just to test it out. When doing it to yourself, make sure you use a mirror to view any stray hairs like the ones I had on the left. Then tuck them in and pin them. Since I am accustomed to bobby pins, this hair do literally took 30 seconds. If you are new to using bobby pins, just play around with it a few times till you get the hang of it and soon, you too will have a 30 second, “get out of your pony tail rut” braided bun. What I love about this look is that I wore it with shorts and a tank top, but I can just as easily wear it with a Little Black Dress for a night on the town. Very pretty Jen – and you know how much we all love anything ‘quick and easy’ that looks 100% beautiful! Perhaps I’ll be able to try a new ‘do’ soon – my hair is finally growing again! After so many years of my hair falling out by the handful and being so lackluster I think (pray) it is finally coming back in – a bit thicker and a trifle more bouncy! I am praising the Lord for this ‘added blessing’ to working so hard to be more healthful! I am just into Week 11 of the liver cleanse diet and I’ve lost 23.5 pounds and all of my bloodwork numbers are improving slowly. The only bad thing is that I literally have nothing to wear. LOL! My thrift stores are not yielding much for me at all and every morning I add to the pile of ‘too big’ stuff to take to donate. I so wish I could go shopping (treasure hunting) with you – you always find the most amazing things! I’ll just have to get sewing for myself soon and of course I’ll keep scouring the thrift stores too. Anyway, my dollar tree has these from time to time, so I bought a bunch for me and my girls, and I have to say, I will never do a bobby pin for a bun again. Thanks for this! That is a really cute idea! I have GOT to get more creative with my hair! I live in FL, too, so this is perfect! Can’t wait to try the spin pins mentioned by Vickie, too. Thanks! Love it! Please don’t ever be embarrassed to share something so easy – we love easy! You make it look so easy…I’m such a dunce with updos!